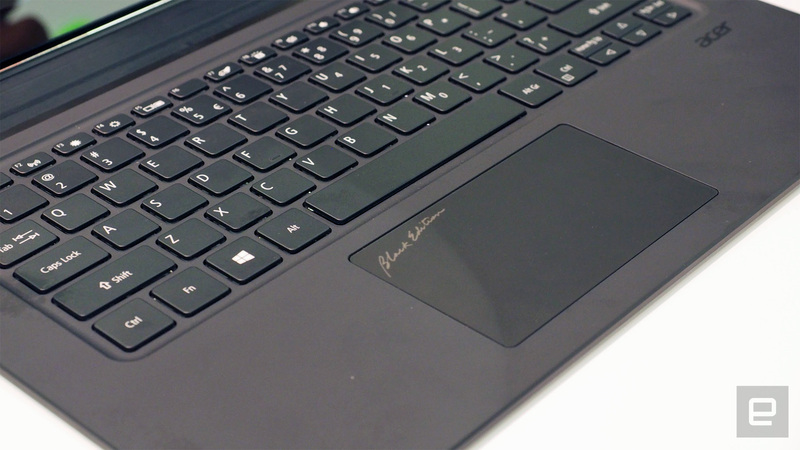 The 2-in-1 hybrid has the potential to be special. There are plenty of pretenders to Microsoft's Surface throne, but they often come with compromises that force you to default to the original. 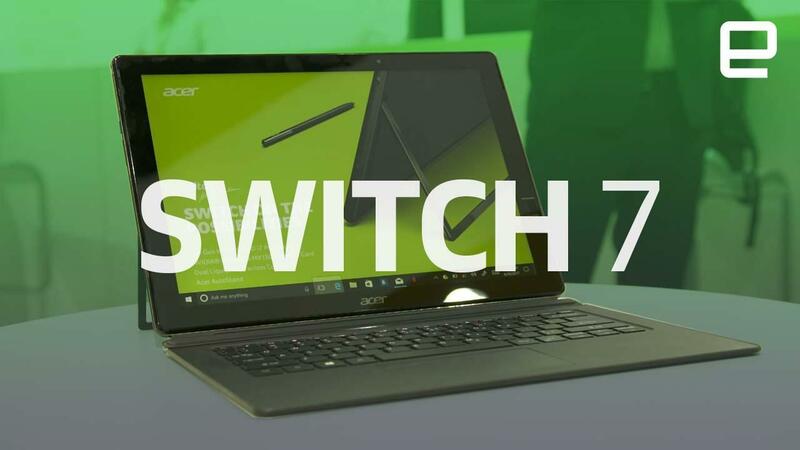 Acer is hoping to buck that trend with the Switch 7 Black Edition, a tablet-laptop hybrid that may succeed where so many others, including the Switch 5, have failed. The Switch 7 comes packing a 13.5-inch, 2,256 x 1,504 display that's roomier in person than you might imagine. It seems certainly big and bright enough to cope with hammering out a last-minute document on a plane or train. And fundamentally, that's what this machine is: a vehicle for folks to get work done while they're out and about. In order to differentiate itself from other 2-in-1 devices, the Switch 7 comes with dedicated NVIDIA MX150 graphics -- not powerful enough to run meaty games, for sure, but sufficient to ensure that the unit runs smoothly enough to handle Word, Photoshop and other productivity applications. Dedicated graphics and Intel's 8th-generation Core CPUs do, however, generate a lot of heat, which is a problem for a small tablet. 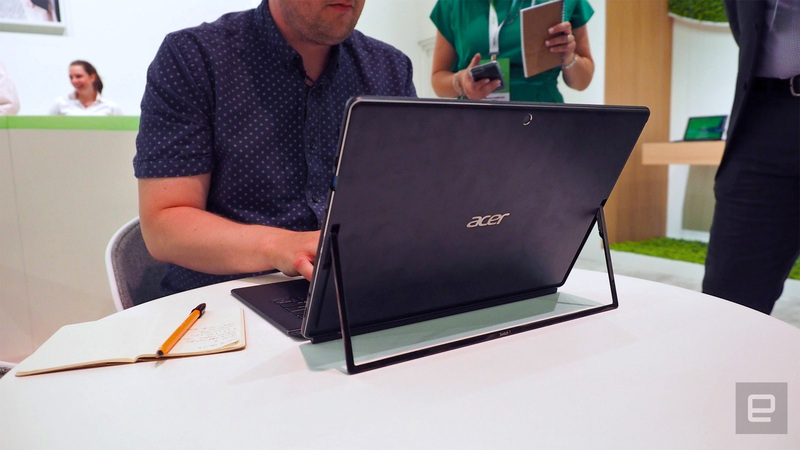 Acer opted not to build a fan but rather to incorporate its Dual Liquid Loop thermal pipes around the chassis that, it promises, will ensure you never burn your lap. In the hand, the device feels sturdier than you'd expect given its fairly large size, but also it's not too heavy, weighing in at around 2.5 pounds. The brushed-aluminum body feels solid and durable, as if the machine could take being thrown into a bag at short notice. We can't make too many claims as to the Switch 7's performance, mostly because the prototype we tried had a few issues. These will, naturally, be ironed out by its official debut in December, but going by its spec list, this device shouldn't be slow at all. As for the keyboard, it's actually one of the nicer versions we've tried in this form factor for a while, thanks to good key travel and keycap spacing. The fact that we were able to sit down with it and almost instantly start hammering 40 or 50 words per minute says something. Then there's the redesigned stand, which pops out when you put enough pressure on the top of the device. As well as being pretty sturdy, with plenty of points of articulation, it too feels nigh-unbreakable, dammit. And it needs to be, given that you can use this device as a graphics tablet. Speaking of which, a Wacom stylus sits in the top left of the display and is capable of reading 4,096 levels of pressure. It certainly won't replace your Cintiq, but it'll do the job for folks who spend a lot of time inside Windows Ink and Illustrator. Right now, all we have is potential and promise, two things that the Switch 7 has in spades, and something that we'll be looking to test when we get more time with the hybrid. For now, if you want to get saving, the Switch 7 will launch in December for $1,699 in the US and €1,999 in Europe.